Is confusion keeping credit card rates stable? The U.S. bank prime rate did not change during the first half of September, remaining at 3.25 percent. No credit card offers changed in the latest survey. That stability is in keeping with what has been a very quiet year for credit card rates. As of mid-September, each of the credit card categories listed above had an average interest rate that was within 25 basis points of where it started the year. There are many economic factors that may be contributing to this interest rate stability, but could confusion be the real reason? Perhaps the leading characteristic of the economic environment this year has been the lack of a clear trend. Credit card companies may be following the philosophy of "when in doubt, do nothing." For example, the year began on the heels of some apparent improvement in economic growth last year. However, a brutal winter soon cooled the economy down, and GDP actually shrunk in the first quarter. However, the economy bounced back with a string of strong employment reports, only to disappoint most recently with lackluster job growth in August. In short, it is not a recession, and it is not strong growth. It's just a continuation of the economic muddle that has bumped along since the end of the Great Recession. Credit card rates are not the only ones that have responded by virtually flat-lining. 30-year mortgage rates, for example, have been in a tight band between 4.10 and 4.20 percent since mid-May. One key difference between credit card rates and mortgage rates is that mortgage rates have dropped sharply over the past decade, whereas credit card rates have not. Over the past 10 years, 30-year mortgage rates have fallen by 1.75 percent. The average credit card rate over that same period has declined by just 20 basis points. By not falling so precipitously in response to a generally low interest rate environment, credit card rates effectively have a cushion against short-term economic developments. Therefore, until an economic trend establishes itself as a clear change from the status quo, there is no reason to expect a dramatic change in credit card rates. This stability is good for consumers in a way, because it lets them have a reasonable idea what their credit terms are going to be from month to month. That stability is especially good for credit card companies, because it comes with credit card rates set at a fairly high level compared with other interest rates. 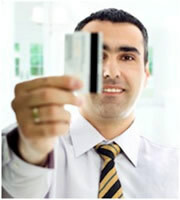 Rates were unchanged for both consumer non-rewards and rewards credit cards. The general environment of stability gives consumers a good opportunity to comparison shop and find the best rate. Students headed back into the classroom without having to worry about changes in their credit cards, as student credit card rates were unchanged in the first half of September. For all credit card categories, the stability in credit card rates gives customers an opportunity to shop around for the best value. For business credit cards, that analysis should be done in the context of how a card's terms fit the organization's needs - for example, how likely is the company to carry over a credit card balance from month to month, and how could it benefit from a rewards program? With no change in credit card offers, the spread between the best tier of rates and the overall average remained at 3.98 percent. 0 Responses to "Is confusion keeping credit card rates stable?"